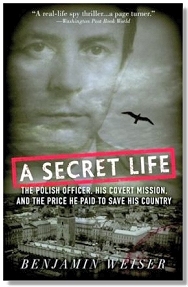 Ryszard Kuklinski was a Colonel in the Polish Army, a military planner and aid to General Jaruzelsk, who from 1972 to 1981 was also a spy for the CIA. He passed thousands of top secret Warsaw Pact documents detailing Soviet military plans to the American intelligence agency. [Kuklinski] was the West's most important source in the Warsaw Pact between the time of Oleg Penkovsky's reports during the Cuban Missile Crisis and the end of the Cold War...Kuklinski joins Claus von Stauffenberg in the pantheon of tragic heroes who betrayed their state to try to save their country. Benjamin Weiser's book — lucid, authoritative, and unputdownable — is a must-read for scholars of the Cold War, and for all of us who lived in the shadows of totalitarianism and enjoy the fruits of the ultimate triumph of liberty. Ryszard Kuklinski died on 10 February 2004 in the USA from a stroke. He is buried in the Powazki military cemetery in Warsaw. Kuklinski's name has become, in Poland, a byword for the country's continued confusion about its communist past...Former communists consider him a traitor, a man who was disloyal to the Army whose uniform he wore. Former opponents of the communist regime consider him a hero...To the very end, Kuklinski, an honorable soldier, was tortured by the thought that his countrymen still questioned the purity of his motives. This page was added on 13 April 2008.